In Hebrew, the word mezuzah (מְזוּזָה‎) actually means "doorpost" (the plural is מְזוּזוֹת, mezuzot). The mezuzah as it is known is actually a piece of parchment, called a klaf, with specific verses from the Torah that is then placed inside a mezuzah case, which is then affixed to the doorposts of a Jewish home. The mitzvah (commandment) of mezuzah is one of the core practices of Jews across religious observance and belief. Many people recognize the mezuzah as an easy identifier of a Jewish home. Understand where the commandment of mounting the mezuzah comes from and how you can affix your very own at home. Written on the parchment are 713 words from Deuteronomy 6:4-9 and 11:13-21, which is more commonly known as the Shema and Vayaha, respectively. Within this verse, there is a literal commandment to "inscribe them upon the doorposts of your home and upon your gates." Shema Yisrael (Hear, O Israel): The Lord is our God, the Lord is one. And you shall love the Lord, your God, with all of your heart, and with all of your soul, and with all of your means. And these words, which I command you this day, should be upon your heart. And you shall teach them to your sons and speak of them when you sit in your home and when you walk on your way, when you lie down, and when you rise up. And you shall bind them for a sign upon your hand, and they shall be a sign between your eyes. And you shall inscribe them upon the doorposts of your home and upon your gates (Deut. 6:4-9). And you shall inscribe them upon the doorposts of your house and upon your gates, in order that your days and the days of your children shall increase, on the land with the Lord swore to your forefathers to give to them, as the days of heaven above the earth. From this, then, Jews derive the command to mark their homes in a physical, visual way. The parchment is prepared and written by a scribe, called a sofer, in indelible black ink with a special quill pen. It must be written on parchment made from the skin of a kosher animal, such as a cow, sheep, or goat. Likewise, many Jews of Eastern European descent (Ashkenazim), especially among Hasidim, will also inscribe the back of the parchment with the phrase "כוזו במוכסז כוזו" (Yoreh De'ah 288:15), a practice that dates to the Middle Ages. Essentially a cipher, the Hebrew takes the letter following the letter of the Hebrew alphabet that it actually stands for, thus כוזו במוכסז כוזו actually says יהוה אלהנו יהוה or Adonai, Eloheinu, Adonai ("The Lord, our God, the Lord"). For Jews with Spanish and Middle Eastern ancestry (Sephardim), this practice is forbidden (Shulchan Aruch, Rambam). After scribed and dried, the parchment is rolled up into a tiny scroll, typically placed inside a mezuzah case, then is affixed to the doorposts of the Jewish home. You can purchase a kosher mezuzah parchment and mezuzah case at an Orthodox synagogue, local Judaica shop, online Judaica shop or Jewish bookstore. Just be sure to have it checked to make sure that it isn't printed on plain paper or machine printed, which invalidate the mezuzah, creating a fake mezuzot, and do not fully fulfill the commandment. Place the mezuzah on the right side of the doorpost as you enter the main room (e.g., on the right side of the door as you enter your home, on the right side of the door as you enter a bedroom, etc.). Place the mezuzah on the upper one-third of the doorpost. Ashkenazim place the mezuzah at a slant toward the main room. Jews with Spanish and Middle Eastern ancestry (Sephardim) place the mezuzah vertically. You don't have to affix a mezuzah on a temporary dwelling or hotel room doorpost. The discrepancy between Sephardim and Ashkenazim placement traditions derives from extensive discussions about whether the mezuzah should be placed horizontally or vertically. In some cases, the policy of Spanish and Portuguese Jew is simply to follow the local custom. Baruch atah Adonai Eloheinu melech ha'olam, asher kideshanu b'mitzvotav v'tzivanu liqboˈah mezuzah. Blessed are You, Lord our God, King of the Universe, Who sanctifies us with commandments and has commanded us in affixing a mezuzah. Place the mezuzah on any and all doorposts in the home, but do not recite the blessing for each one. A single blessing on one mezuzah placement covers the entirety of the home. If you're wondering which doorposts and entranceways are required to have a mezuzah to fulfill the commandment, the answer is basically every single one of them, except bathrooms. There are differing opinions about garages, crawl spaces, and even balconies or patios. When in doubt, ask your rabbi. Once the mezuzah is affixed, your obligation to mount the mezuzah essentially is complete, but it is a good idea to regularly maintain your mezuzot. 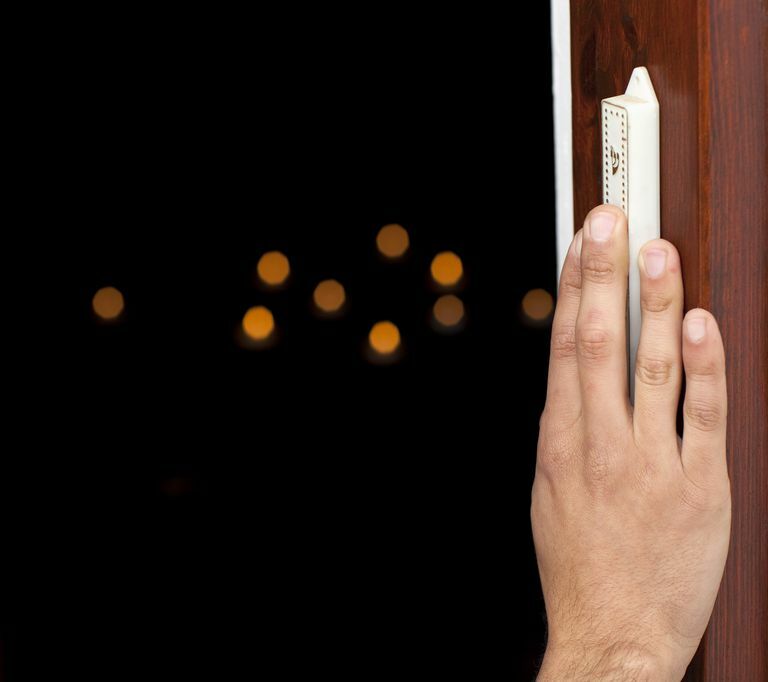 If you've noticed people touching the mezuzah as they enter and exit rooms and touching their fingers to their lips, you're probably wondering where this comes from and whether it's required. Although this isn't a commandment, it's a custom that arose in the Middle Ages. Be sure to have your mezuzah checked twice within every seven years for defects, tears or fading (Babylonian Talmud Yoma 11a and Shulchan Aruch 291:1). This is especially important for mezuzot placed on outside doorposts of the home because the weather can damage and age a mezuzah, forcing it to become unusable.